Domino’s potholes: Domino’s announced on Monday that it was paying to repair potholes in towns across America. People can nominate their town’s for road repair through their Facebook page and there has been an overwhelming response. 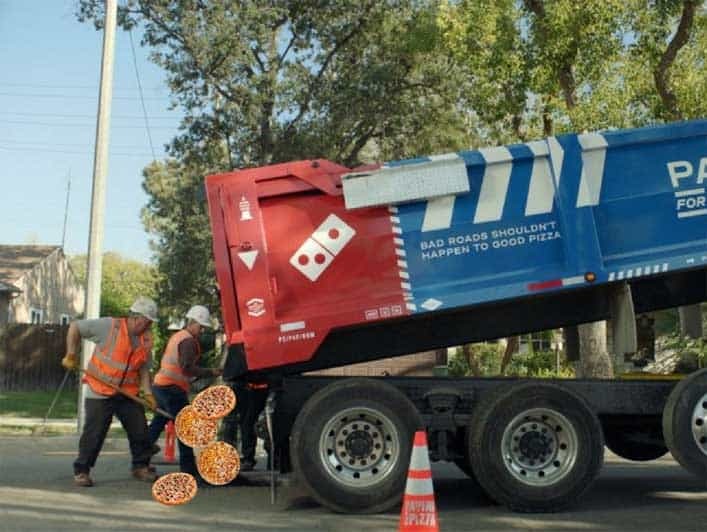 While some people are branding this move as dystopian the truth about the repairs are finally coming to light as it was discovered that stale pineapple topped pizza were being used to fill the holes. The move has gone down well with pineapple pizza haters, whose motto “the only good pineapple pizza is a buried one” seems to have been prophetic. Though some Christian’s believe that prophesy died out after anchovies were included as a topping. Whatever you may think, these pizza filled Domino’s potholes are a great marketing ploy, so much so that other companies are starting to get in on the act. News has reached us that two-day old Krispy Kremes are being used to patch walls along the interstate.